The Thanksgiving Parade. Vibrant holiday storefronts. The movie Miracle on 34 Street. Macy’s was the pinnacle for extravagance, tradition and shopping. Those days are over. In the 1920s, department stores were innovative and brought people in for one stop shopping. Jump ahead to 2017, Macy’s is barely surviving and it’s leaning on discounted items sold at its off price Macy’s Backstage outlet to increase sales. The basic rationale behind department stores—a one-stop shop for customers—is eroding. Millennials are shopping online more while older shoppers are turning to discounted retailers. Stores like T.J. Maxx and Marshalls have seen annual sales exceed those of department stores like Nordstrom and J.C. Penney combined. TJX Companies, the parent company of T.J. Maxx, Marshalls and Home Goods, share price of $73.90 which is three times that of Macy’s today. Macy’s Backstage is trying to connect with savvy shoppers by offering more designer items at a discounted price but, some might not be buying it because it’s not discounted enough. “They are diluting the Macy’s brand down to the T.J. Maxx level,” says Jeff Sward, retail and merchandising expert and founder of the site Merchandising Metrics. “The upside is that they are slowing the erosion of market share shifting to the T.J. Maxx level of the business,” Sward continues. #MacysBackstage just saved me a ton of money! Just got Versace shoes for me originally $108 for wait for it…$25! #Plus baby clothes cheap! Macy’s has had nearly three consecutive years of sales declines. Even though its latest earnings report beat the forecast for profit per share, same-store sales fell for the 11th consecutive time. Five years ago, same-store sales increased 3.7% in 2012. “With its low stock price it should have failed by now,” says Peter Morici, a professor at the Robert H. Smith School of Business at the University of Maryland. Backstage and Macy’s other initiatives to drive people to store are like “rearranging chairs on the Titanic,” he said. With Backstage outlet stores, the teacher has become the student in the realm of customer tastes. Macy’s is taking business models from stores like T.J. Maxx and Marshalls. For a Marshalls shopper, the excitement is the hunt for new things every time they go into the store. Macy’s is trying to cash in on that thrill. That’s not how it looked on Black Friday for the Macy’s at Queens Center Mall. In the very messy Last Act clearance section, which is part of. It was pure chaos. Shoe sizes were mixed up. Designer clothes were strewn on the floor or dangling off of hangers. One frustrated shopper slammed down a purse she intended to buy saying that it was still too expensive even though it was part of Macy’s Backstage discounts. Aggravated shoppers or not, Macy’s is planning to expand Backstage effort. “…It continues to grow as we get smarter about it,” said chief executive officer Jeffrey Gennette, on the earnings call for the third quarter. Along with Backstage, Macy’s is pushing its app, digital sales, and new loyalty rewards program in attempts to win back straying shoppers. The rewards program is targeted to its loyal shoppers, which make up about 10 percent of its customer base and currently accounts for about half of its sales. Gennette wants customers to spend more…much more. This includes dishing out more cash on Backstage items. But Macy’s seems to be misunderstanding its new customers. Discount shoppers are practical. They shop on the premise that products are affordable now and might not be there tomorrow. They aren’t going to spend more than they can afford. Millennials have also embraced working from home or remotely, so there’s no need for fancy clothes in a corporate office. Many men aren’t buying extravagant suits anymore, and those that are can find them cheaper on Amazon or in other stores. Women and men are also opting for more inexpensive fashions from other retailers like Zara and H&M. Behavioral-finance folks who preach that spending on things like dining and travel makes millennials happier than buying a blender or another pair of jeans would be right. A 2014 Harris Poll found almost 4 out of 5 millennials said they would rather spend their money on experiences than things. 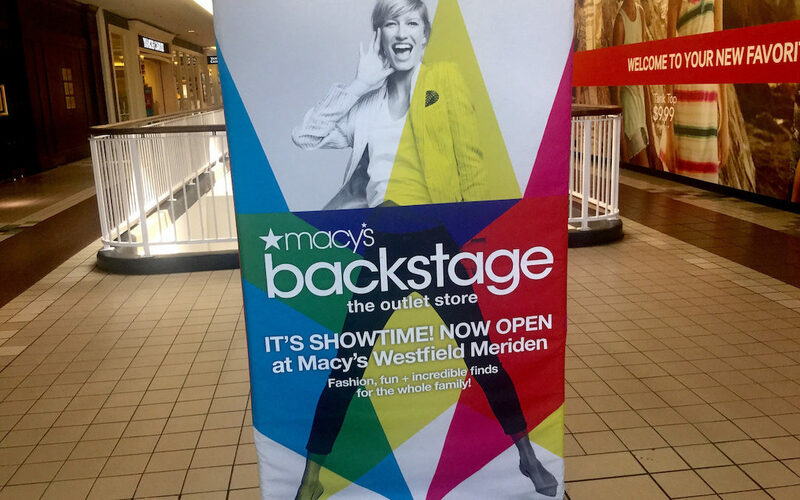 There is another downside of Backstage; it is key to Macy’s current identity crisis. “A major risk is poor execution, which could convey the impression that Macy’s sells low-quality merchandise, perhaps becoming viewed as a retailer that has an in-store dumping ground for unwanted goods, says Bruce Kaser, associate editor of stock and investment advice site The Turnaround Letter. Like a giant deflating Snoopy balloon in the Thanksgiving Parade, Macy’s might not be able to stay afloat. The struggling department store is trying to grab everything on its way down, including cashing in on discounted products through Macy’s Backstage. “Woolworth is gone, Sears isn’t as big as it used to be and it seems like Macy’s is going too.” says Semion.